Have you Ever Met a Real Princess? 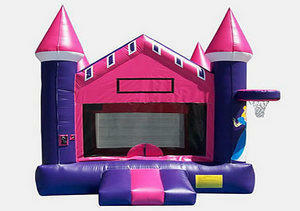 The Princess Castle Inflatable was engineered by adding Heightened, Colorful Castle Spires. Plus, we combined Royalty Colors, such as, Royal Purple and Rich Shades of Pink and White for that Extra Magic. The Princess Castle is a BIG Hit and will touch the Hearts of every Princess you meet.